Initially demonstrated at CES in January 2014, AMD has been working on hard on making their FreeSync technology a reality for at least the past 14 months. A reaction to the public release of Nvidia’s G-SYNC the previous month, the implementation was obviously in its infancy – the demonstration was performed on a laptop where the engineers had far greater control over the scalar component of the LCD panel. Nevertheless it showed great promise. AMD then went down the route less taken – attempting to make the standard an open one which could be adopted by monitor manufacturers without expensive licencing arrangements or additional costs to the end-user. Their argument was simple – the VESA V-Blank specification, which defines the refresh rate of a given panel, was too limited to allow true synchronisation but that an implementation would be possible which didn’t place onerous requirements on monitor manufacturers. VESA eventually found that their argument had some merit, despite representations against it by their competitors, christening the new standard Adaptive Sync. As part of DisplayPort 1.2a Adaptive Sync is a purely optional standard which monitor manufacturers can apply to their DisplayPort 1.2-enabled monitors, free of liscensing. AMD’s graphics hardware can then make use of FreeSync technology to essentially tell the monitor when to grab a new frame from the frame buffer, rather than rely on continuous polling from new and more complicated scaler hardware. Even at that stage one would have assumed that getting manufactuters on board would have been very difficult. However news percolated in mid-to-late 2014 that certain panels had been unofficially adapted via firmware update to support FreeSync, and it turned out by CES this year that the number of manufacturers who were willing to develop new designs for FreeSync was substantially more than most would have expected. With the likes of Samsung, Acer, BenQ and LG on board the future certainly looks promising. With input from AMD, the latest DisplayPort specification now includes DisplayPort Adaptive-Sync – a feature that allows the monitor's refresh rate to vary (e.g., between 30 and 144Hz) and lets the graphics card control the refresh rate instead. This eliminates large jumps in frame rate for noticeably smoother gameplay. Gamers sensitive to input latency – a delay between mouse movement and cursor movement – will also see a distinct increase in responsiveness. 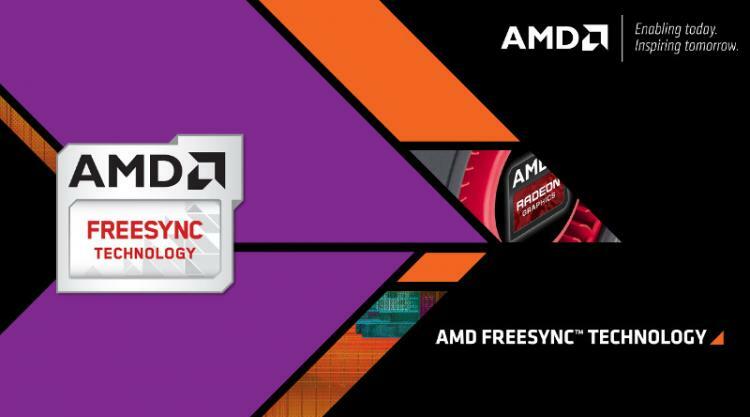 AMD FreeSync™ is our name for the complete solution: an AMD Freesync™ technology-compatible AMD Radeon™ graphics card, an AMD Freesync™ technology-enabled AMD Catalyst™ graphics driver and a DisplayPort Adaptive-Sync-compatible display. These three pieces will work together to abolish tearing, eliminate stuttering and greatly reduce input latency, making life better for gamers, and – really – for anyone who appreciates a seamless viewing experience. Today AMD are releasing the first FreeSync drivers – Catalyst 15.3.1 – to complement a new wave of FreeSync monitors due to be released imminently. FreeSync is compatible with these new monitors and AMD graphics hardware based on the GCN 1.2 architecture, essentially R9 290-class, R9 285-class and R9 260 GPUs (including the older HD7790) and selected APUs. Looking ahead, new GPUs and APUs including the upcoming Carrizo line will also support FreeSync.